Do you have a quick product related question for us? 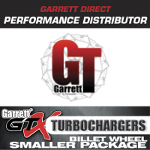 Testing continues on the new ATP bolt-on upgrade utilizing the first level turbo (Garrett GT3071R) option. Still sporting the stock TMIC and stock exhaust, project STI appears even more mild mannered than the average STI off the street. Once at the dragstrip, the project car unleashes the beast within and one can only take note of its willingness to pull through the 1/4 mile with so much force. We found the 3071R powered STI with the 400/400 combo to be incredibly easy to drive with most of the torque available even at part throttle. 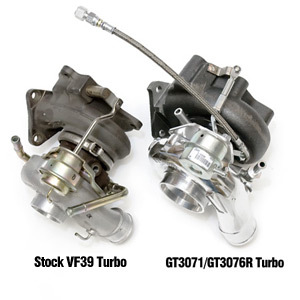 The turbo seems to compliment the shorter gearing of the STI gearbox quite well, providing the most available torque between gear changes...and even with the modest amount of power made, the STI still goes through the traps at halfway through 5th gear...that's a lot of shifting! Roger finds it easy to nail consistent low 1.6x sixty foot times with 4500 rpm launches and pedaling through the spinning stock tires. 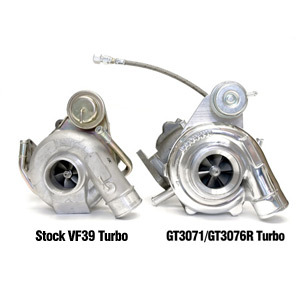 Ball bearing turbos are explored for the STI platform. Home | Help | Contact Us | About ATP All contents © 1997-2016 Advanced Tuning Products, Inc. All rights reserved.